10 inch Android 5.1 Car DVR 4G WiFi/Bluetooth Rearview Mirror Cam ADAS GPS Navi. 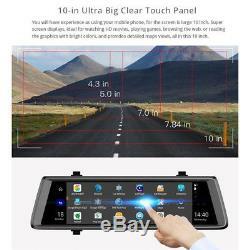 10in Touch Screen 1080P FHD Lens 4G WiFi Android 5.1 Car Rearview Mirror DVR Bluetooth Dash Cam ADAS GPS Navigator Main functions: Triple wide rearview by streaming video technology 4G module for SIM card (Internet)+WIFI module router= surfing faster Car assist mobile app + Internet surfing = remote monitor. ADAS Plus Make Driving Safer. GSM: 900 (B8) / 1800 (B3) TD-SCDMA: 2100 (B34 /) / 1900 (B39) WCDMA: 2100 (B1) LTE: FDD, 2100 (B1) / 1800 (B3) TDD: 2600 (B38) / 1900 (B39) / 2300 (B40) / 2500 (B41). MPG, 3GP, FLV, MP4, H263, H264;Photo. 1 x Manual (English Only). 10-inch HD large touch screen 2. Android 5.1 OS, quad-core high speed operation 3. RAM 1GB + ROM 16GB 4. Support ADAS track offset, vehicle ahead warning, make driving safer 5. Front 1080P recording, support reversing video 6. 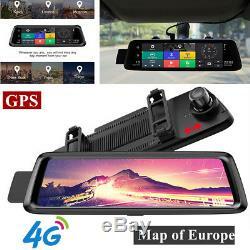 4G Internet + Bluetooth hands-free calling + GPS navigation + fixed electronic dog, driving recorder; 7. Support two-way WiFi hotspot 8. Remote monitoring of vehicle assistants 9. Support TF card expansion, maximum support 128GB 7. Loop recording, photo taking, gravity sensing Specifications: Type: A(no memory card) OSD language: Slovenian, Turkish,ish, Hebrew, Swedish, French, Slovak, Japanese, Polish, Portuguese, Thai, Chinese(Simplified), Dutch, Russian, Italian, Chinese(Traditional), Arabic, Czech, German, Russia , English, Korean Battery: built-in battery Imaging Sensor: 1/3 Color Cmos Screen Ratio: 16:9 Assembly Mode: Rearview Mirror Interface: Micro SD/TF, USB2.0 Touch Screen: Yes Video Code: H. 264 Max External Memory: 128G GPS Logger: external View Angle: 150 160° Memory Card Required Reading Speed: Class 10 Pixels: 5MP Battery Life: about 10 hours(sleep mode) Camera Resolution: 1920x1080 Video Format: TS Display Size: 10 inch Interface: SIM card Steaming Video Technology: Support GPS Navigation: Yes, support online and offline navigation Bluetooth Hands-Free: support Dual lens: Yes, support dual lens recording simultaneously RAM: 1GB ROM: 16GB(System will occupy 3GB). ADAS: Yes, support LDWS / FCWS/ FVMA Remote Monitor: yes Warm Tips: Please DON'T use the USB cable to the power supply the car DVR. Otherwise, it could not power on. Please use our standard car charger to the power supply the car DVR when you receive the package. Before order, please kindly check whether your local 4G SIM card bands is. GSM: 900 (B8) / 1800 (B3). > It is all mirror IPS screen of 10 inch. The display employs new techniques and technology to precisely follow the curves of the design, all the way to the elegantly rounded corners, to ensure 100% image view will be displayed in this 10inch entirely mirror screen. Triple wide rearview by streaming video technology. It is equipped with this advanced streaming media technology. Makes the driving rear view more widely. Dule for SIM card (Internet)+WIFI module router=Surfing faster. 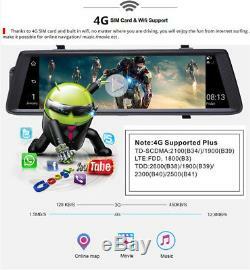 Thanks to 4G SIM card and built in wifi, no matter where you are driving, you will enjoy the fun from internet surfing , make it possible for online navigation/ music /movie ect. Remarks: before you place the order, please kindly check whether your local SIM card network is below bands or not. Otherwise, the car dvr will not identify your sim card. 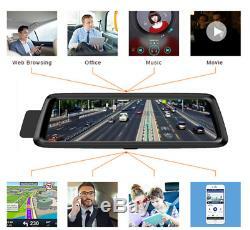 4G version device supports ADAS function. Advanced Driving Alarm Systems (LDWS/ FCWS/FVMA) , it is useful alarm systems to keep your driving safer. Car assist mobile app+Internet surfing =Remote Monitor. With our unique remote monitor mobile app Car Assist and internet connection, it allows you to remote monitor your car driving path, and what happened around your car, no matter where you are. Wide rearview by streaming media technology. 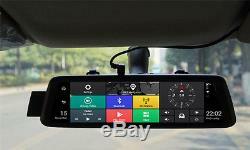 This is all new technology for rearview mirror dvr. Junsun A900 is equipped with this advanced. Streaming media technology, makes the driving rear view more widely , it is triple wide view if compare to the normal mirror. >> Lane Departure Warning System (LDWS). Drowsy or distracted driving greatly increases the chance of an accident on the road. The LDWS will alert the driver when the vehicle goes off lane in a speed over 50 km/h. >> Forward Collision Warning System (FCWS). Accidents can be avoided by maintaining a safe following distance. Road Safety Warning System calculates the real-time distance between your vehicle and the vehicle in front of you, while driving above 30 km/h in expressways or under 30 km/h in a busy city, and issues a 3-level early warning to the driver depending on the danger of collision. >> Front Vehicle Departure Warning (FVDW). When your car is stopped at an intersection or in traffic, the intelligent guidance system informs you that the vehicle in front has started to move, preventing a delayed response just in case you stop looking ahead. PS: choose 4G function will have ADAS. Remote Monitor on Car Assist APP. 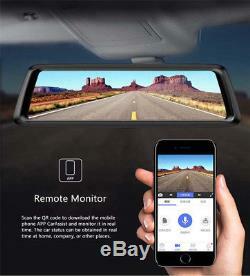 Remote Car Assist APP, check views on the mirror dvr by smart. Keep surfing Internet and remote monitor your car driving path. Download important videos and one Key to share beauties of car driving. 24 hours to protect your car. It will send warning that "Car is shaking" to remiand you. Car driving path will be recorded and real-time payback on car assist APP. One key to capture 10s video on car assist app via WiFi connection. Read pictures and videos from other friends. Remarks: Please connect the dvrs wifi hotspot to make sure your smartphone and the car dvr under the same network. Need insert SIM card in the DVR. 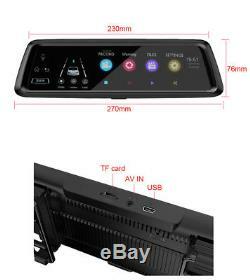 The DVR need connect car battery to support this remote moniter, please use an OBD to suply power when car is not start. EURO MAP including : Russian, Albania, Andorra, Austria, Belarus, Belgium, Bosnia, Bulgaria, Croatia, Cyprus, Finland, France, FYROM, Germany, Gibraltar, Greece, Hungary, Ireland, Italy, Latvia, Liechtenstein, Lithuania, Luxembourg, Malta, Moldova, Monaco, Montenegro, Netherlands, Norway, Poland, Portugal, Romania, Russia, SanMarino, Serbia, Slovakia, Slovenia, Spain, Sweden, Switzerland, Turkey, Ukraine, UnitedKingdom, Vatican, CzechRep, Denmark, Estonia. Record HD Video in 1080P mode. 2.0 Wide Angle front camera lens, capture all the action in crystal clear HD video. Video and audio are automatically recorded in an endless loop and saved in memory card. Unexpected moments or any social media worthy video. Smart 24-hour Parking Monitoring is So Convenient. When you park the car in somewhere, turn on parking monitor function, it can recording. The process when something happens to your car, such as stealing something from your car. Need to connect OBD line. When the car encountered a collision, the video will be blocked. Restore the scene of the accident, to prevent misuse, delete or overwrite. Seamless Loop Records Will not Leak Seconds. Using 1080 30fps resolution high-definition video recording. High-definition video to cope with high-speed read and write needs. Support Dual Cam Simultaneously Recording. This Car DVR allows for simultaneously recording videos from two different angles. Picture in Picture display will let you have clear view from front and back-up camera. When the car in Reversing Gear. 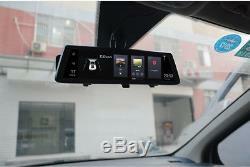 This car dvr will automatically switch to the back-up camera image view with parking line. If there is WiFi network available nearby, DVR with WiFI. Built-in Android 5.1 Operating System. Build in RAM1GB+ROM 16GB internal storage, there is about 0.8GB available for application installation, and about 12GB internal storage available for data storage. 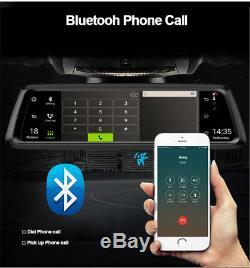 Thanks to bluetooth hands-free, after pairing the bluetooth between dvr and smartphone. You could make and receive calls directly from the mirror dvr itself with the built-in MIC and speaker. Just set a frequency on your FM and simply tune. Frequency as set in the dvr to transfer the. Video, Voice Call, Video Call to your car speakers. We recommend using original APPs of devices only. Do not install other customized APPs. They can't be compatible with our devices. Installing too many APPs, will also slow down the operation of the equipment. Q1: What's the dvr DC INPUT? The car dvr only support DC 5V IN, please don't connect with 12/24V Power directly, otherwise will burn the dvr's. So, Please use car charger to plug into cigar lighter to power supply the car dvr. Q2: What type of Micro SD card use for car dvr? Please use the High Speed Class 10 micro sd card. Before dvr recording recording, please format the new memory card firstly in dvr. Q3: After disconnect with Power, the dvr will automatically turn off? Yes, dvr will automatically Turn ON / OFF accordingly when Power ON/OFF. And dvr main power supply is from car charger, not from built in battery, so dvr battery s standby time is short. Q4: Does the dvr support Parking reverse function? Yes, if your car dvr support dual lens, when get your car in reverse gear, the dvr will automatically switch to the rear camera image with parking line. Q5: How to connect the Rear Camera? Please connect the rear camera's Red Wire with your car Reverse Lamp Power's Positive Pole (+). And other side connector , please plug into DVR AV IN port. Q6: Why the rear camera image direction is opposite side? When car in reverse gear, if the rear camera image is opposite, please enter dvr's settings to turn on the Camera Flip function, and then the rear camera image will be mirrored and correct. 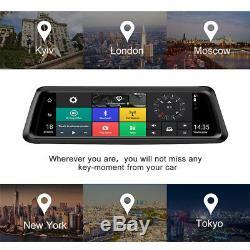 Q7: The GPS Navigation no need network support? 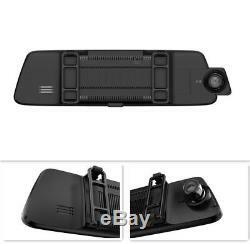 Yes, the car dvr is with external GPS antenna, support OFF-LINE GPS navigation, no need any network support. Q8: Why sometimes GPS satellites search slowly? Weather, High building, outdoor or not will influence the GPS satellites searching, please go outdoor and open space to search satellites. And the first time , GPS searching will take a bit long time than the second time, please kindly wait. Q9: If want to turn off the Screen background light, how to do? If you want manually turn off screen background light, please press Power button one second, you could turn on/off the screen background light. All items will be checked before packing. All items are new and of high quality. We will reply you within 24- 48 hours. 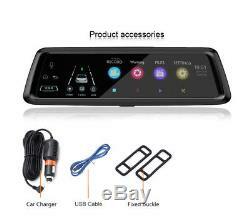 The item "10 inch Android 5.1 Car DVR 4G WiFi/Bluetooth Rearview Mirror Cam ADAS GPS Navi" is in sale since Wednesday, August 15, 2018. This item is in the category "Vehicle Parts & Accessories\Car Parts\Interior Parts & Furnishings\Other Interior Parts & Trim". The seller is "tiantianseller" and is located in CN. This item can be shipped worldwide.